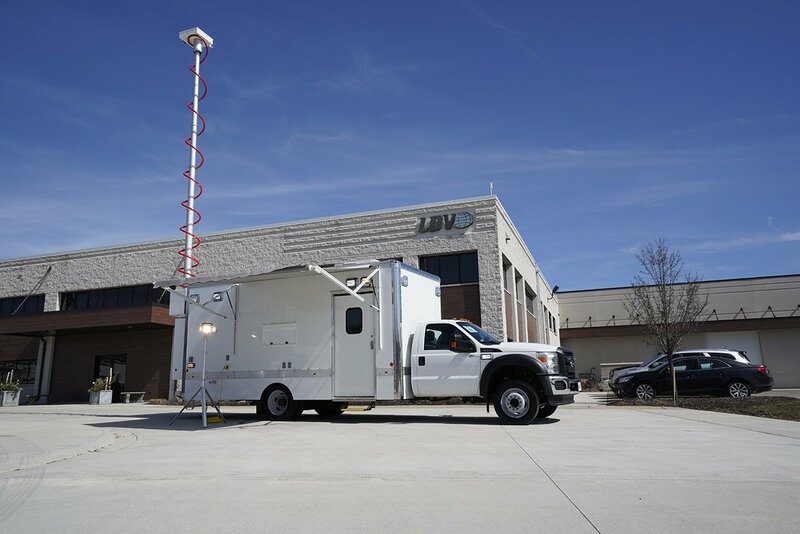 Aurora Sciences Flight Simulator chose a Ford F550 chassis for their mobile operations center for piloting commercial drones. The interior includes custom fabricated aluminum cabinets with dry erase writing surfaces, adjustable closet shelving, a flip down countertop for a workstation, galley kitchen, and more. Two low profile air conditioners and two wall mounted electric heaters help keep the temperature comfortable. Aurora also chose to include a gasoline generator in its own custom fabricated compartment. The exterior includes emergency lighting, dual telescoping tripod light poles, Zone Defense color back up camera system, and an electric awning. A 40' pneumatic telescoping mast with a custom fabricated aluminum bucket has been added to the back of the vehicle as well.